Le Grau-du-Roi is a resort on the coast of Languedoc-Roussillon, in the Gard department between the historical walled town of Aigues-Mortes and the seaside resort of La Grande-Motte. 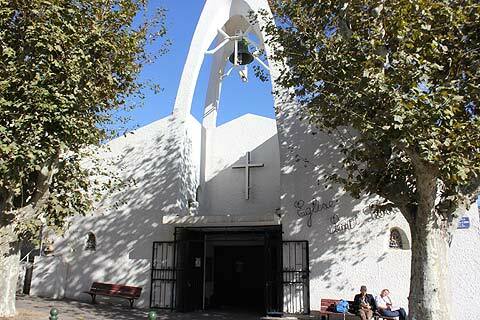 The Camargue region is to the east, while beaches are plentiful along the Mediterranean coast near here. Surrounded by the sea to the south and waterways (small rivers and a lagoon) to most other sides, the town itself is based around a canal, and has an attractive original centre to explore. 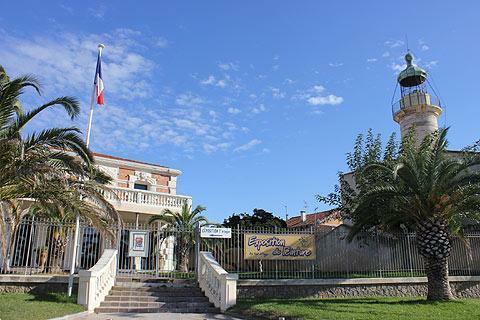 There are also many resort type apartments and holiday houses at Le Grau-du-Roi, and the resort is a popular campsite destination. 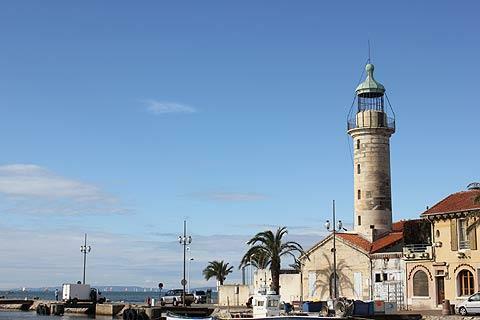 Most visits to Le Grau-de-Roi will be centred around the fishing harbour and canal front, which is attractive, the sand dune region - and of course the extensive beaches. The town is divided in two by its central canal, the Chenal Maritime, along whose edges are shops, restaurants and bars as well as a pleasant, almost spanish-style church and the lovely 'Maison du Dauphin' - the attractive building in the photo above. Spreading out from the canal is the Rive Droite and its beaches and the fishing harbour is on an inlet from the canal. 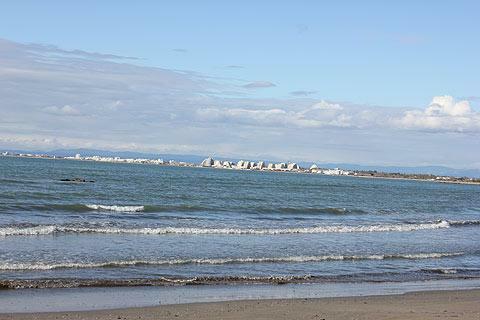 To the left is the Rive Gauche with its beaches plus the large Marina of Le-Grau-du-Roi called Port Camargue. The popular Seaquarium is by the beach on the Rive Gauche. The canal is flanked by two piers where it meets the sea and at the end of each of these is a lighthouse. From here you get excellent views of La Grand-Motte with its distinctive style of architecture. 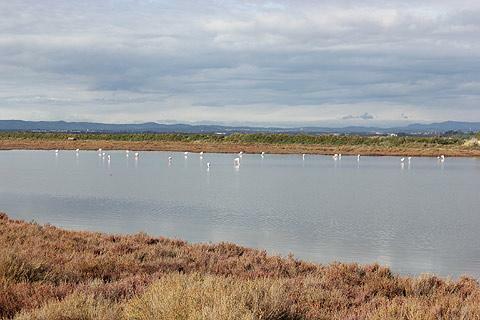 Behind the town are the Etangs where you will be sure to catch plenty of glimpses of the lovely pink flamingos, indeed the Camargue is the only place outside of Africa where you can see such large quantities of these colourful birds. If you wish to see more of these lovely birds then visit the Parc Ornithologique de Pont de Gau set in 60 hectares and whose nature trails allow you to see many wetland species of birds, flamingos included. The park is open all year round and is located at Saintes Maries de la Mer a few kilometers east of Le-Grau-du-Roi. There are several beaches along the coast here, stretching over almost 20 kilometres of coastline. Espiguette is the best known and others including the south beach, the north beach and the Boucanet beach. Espiguette also forms part of a large protected natural area of sand dunes. The beaches have received the 'Blue flag' award for cleanliness, the environment and the facilities (as has Port Camargue). Notable architectural highlights include the early 19th century lighthouse with its traditional lantern; the Maison du Dauphin (representing the style typical of the beginning of the 20th century) and several villas dating from the early decades of the 20th century. Market days in Le Grau-du-Roi are Tuesday, Thursday and Saturday mornings, as well as a daily fish market and a weekly market (wednesdays) held during the summer only in Port Camargue. During the spring and summer regular jousting displays take place on the canal. The Joutes de Le-Grau-du-Roi is a great display of jousting between two boat teams. It is hugely popular here and in neighbouring Sete but not something you tend to see in many places. If you get a chance to see the jousting its well worth watching. Note: a 'grau' is an inlet in the coast formed at the weakest point on a coast and linking the sea with the inland waterways. One very popular attraction at Le Grau-de-Roi is the 'Seaquarium'. At the Seaquarium you can see a very large number of fish, sea creatures, seals and rayfish - the highlight being a tunnel that passes through the large underwater tanks, and several displays that explain sealife. In the requinarium (requin is French for shark) you can also see and learn about sharks. 25 different species of shark can be seen. The Seaquarium is open every day except Christmas Day, the price of admission is about 12,50 euros, or you can buy a family admission for 37€50 (2 adults, 2 children). 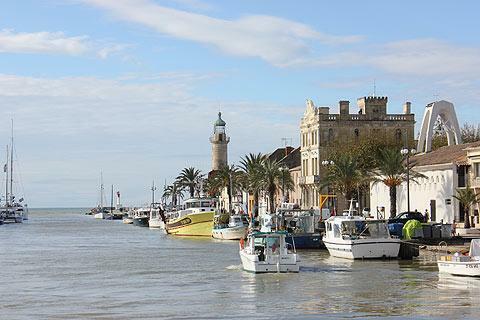 Le Grau-du-Roi is also known for an extensive harbour and port area on the southern edge of the town called Port Camargue, which is one of the largest pleasure ports in Europe and also a major centre for the active fishing industry. It was developed in the 1960s and 1970s (largely by the same architect as developed La Grande-Motte) and has a good number of interesting buildings in the style of that period. A seasonal market is held in Le Grau-du-Roi on Wednesday.